We all make excuses as to why we don’t want to exercise – we’re too tired or too busy and tell ourselves we’ll go tomorrow. If you find you’re starting do this every day, how can you find the motivation to get back into it and stick with your fitness goals? Setting yourself realistic targets means you're more likely to succeed. There’s no point in trying to lose 100lbs in a month or trying to become a bodybuilder overnight. If you set unrealistic goals, you’ll become disheartened and likely give up altogether. Figure out what your personal goals are; do you want to lose body weight, become toned, build muscle, or improve your running distance? Speak to one of our Wellbeing Personal Trainers who can help you set realistic targets. It takes 21 days to form a habit, so making small exercise goals repeatable will encourage forming a new habit that you'll easily implement. The simpler your small goal is, such as going to the gym every Monday and Wednesday to start with, the more likely you are to form this habit and stick to it long term. Don’t do anything that isn’t sustainable long term. Going to the gym six days a week or starving yourself and living off only salad leaves isn’t sustainable, enjoyable or healthy. Find a routine that works for you, so that week on week you can keep it up and enjoy it too. Like any lifestyle change, it can take some time to adjust. You might find you feel really motivated in the first couple of weeks, but your new routine is time-consuming and exhausting. If that’s the case you’re probably doing too much. Aim for 30 minutes a day, 5 times a week, with two of those days being resistance or weight training. It has to be sustainable long-term. Eventually, making exercise a part of your routine will be as normal as having breakfast. It doesn’t matter if you’re doing hours of exercise, if you’re filling your body with the wrong foods you’ll likely gain body fat, have little energy and feel sluggish which won’t help your motivation. Make sure you’re eating a balanced diet to fuel your body and mind, so you don’t feel like skipping that class at the last minute. 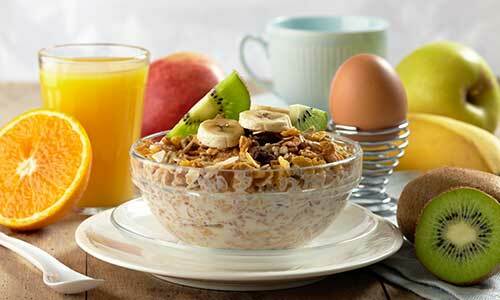 Try to have a healthy breakfast every morning to fuel your body to keep going the rest of the day. Plan ahead so that you have healthy snacks on hand to curb those unhealthy cravings. Read more about nutrition tips to boost your energy. If you’ve hit one of your targets, make sure you reward yourself. Treat yourself to a meal out, some new shoes or anything that makes you happy. 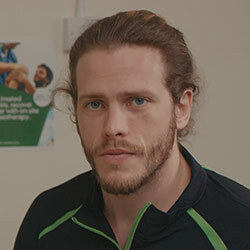 If you feel disheartened, speak to one of our Wellbeing Personal Trainers who can help you figure out a new routine, or set you some realistic goals.